Hey…..wanna keep in touch regularly. Please be sure to subscribe to The Beginning Rancher’s Wife. My office is my nemesis! I love it….I hate it! I think that for the rest of my life I will be trying to find a way to put together an office that works for me. I’ve read every blog, every book, every article that I can find on office makeovers and none of them have all the answers for me. My office is multi-functional. It’s the location where I “plant” myself while we homeschool, it’s where I write my blogs, its where I plan for Ranch events and duties, it’s where I hold online meetings, its where I have my quiet time, its where I am DESPERATELY trying to put finishing touches and more on our new Artios curriculum. You get it right! It’s like a very busy part of the house. My office has been located in various places. I tried putting it over in the cabin but then I was too removed from everyone and all the needs in the family. Currently, its in the sunroom but now I’m SO available, I can’t do anything without being interrupted every 10, no make that every 5 minutes. John and I both work from home so, let’s just say, it gets complicated. 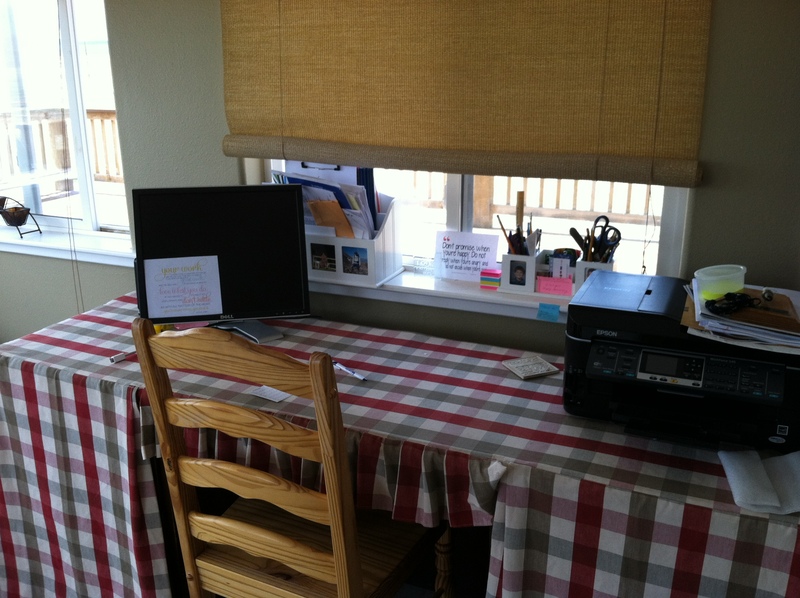 I want my office to feel like part of the home and yet be a reflection of me, have an organizational system that works for multi-tasking and yet, feels welcoming and inviting. Now, how to do that without any money. The makeover below wasn’t just something that I decided to do one day and went out and bought a bunch of stuff. Nope, it has been a work in progress. Shoot…it will probably continue to be a work in progress. It has come from odds and ends that were bought for other purposes other than an office and repurposed for me including fabric that was originally meant to reupholster some furniture and/or make curtains, a desk salvaged from a office warehouse, and a bookcase that was meant to go with another desk in another room. 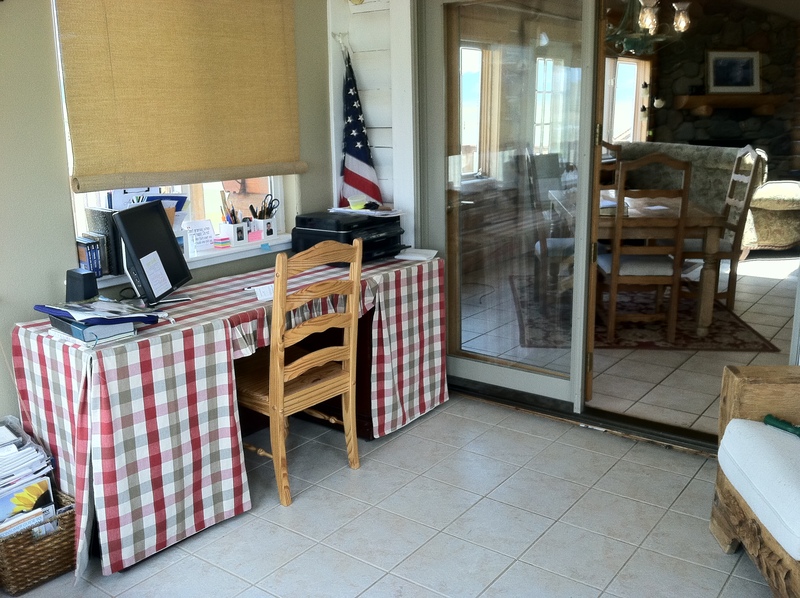 I started by using fabric meant for reupholstering and constructed/sewed a covering for the desk to mask it’s “officey” feel….and the result, was a reflection of me….reds, neutrals, checks and a tiny bit, a TINY bit of ruffles. 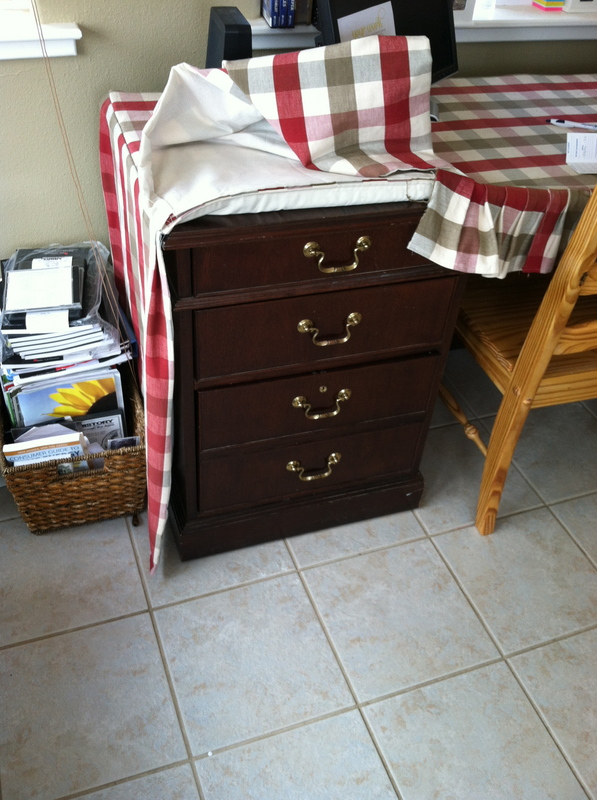 Since I don’t have to use the drawers that much, I even covered the drawers with flaps that can be raised when I need to get into the drawers. 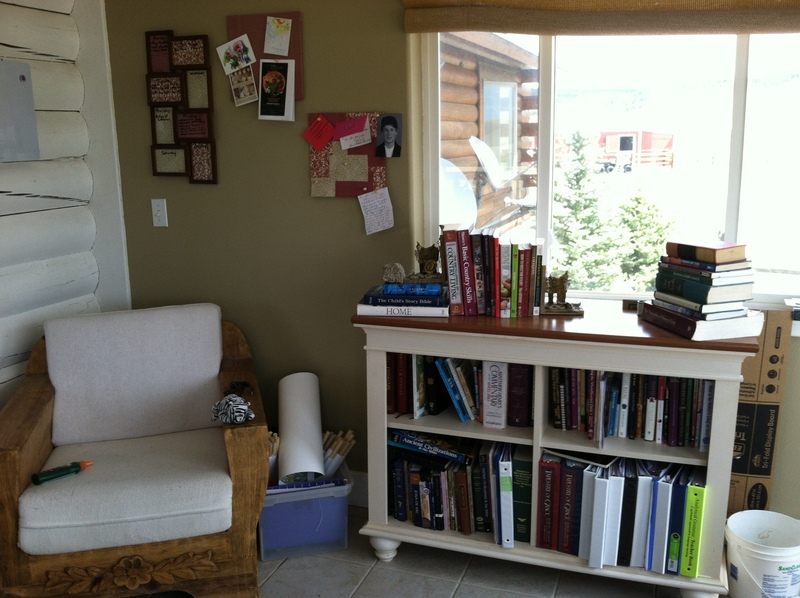 Since I despise tile floors, especially in a log home, (can you believe it), I did splurge and bought a small rug that sets off the red in the desk fabric and I pulled in a bookcase from another room, one that matches another desk, but that fit the “mood” of this room better. I then filled it with my precious notebooks, my homesteading resource books, current research materials I am using in my writing and homeschool books Ioks need to keep at my fingertips for use with Jared. I found a picture on pinterest of a multi-picture frame filled with coordinating scrapbooking paper that someone used to write on repeating weekly tasks in each of the sections of the frame. Now THAT was a project I could do with my limited crafting skills and one that I could do inexpensively. So, now those weekly office tasks that show up on the same day every week are written on this board in dry-erase marker and it looks pretty too. I went through some old boxes and found some squares of cork and covered them with coordinating scrapbooking paper. Hung all of this on the wall and made it my information central desk. I made sure that we moved the desk so that I could look out the window towards the gate at the front of the ranch and so that I could always “lift up my eyes to the hills, from whence comes my help.” Cleared the top of my desk as much as I could and tried to get rid of as much clutter as possible by putting those things I need access to, but don’t need every day, into plastic storaage containers, covering them and using them as “end tables” until I can think of something better to do with that type of stuff. Plastic Storage Containers – most were purchased about six years ago for a different purpose. There is still more that I’d like to do in here. I’d like a bigger rug for the floor that is so cold during winter. I’d like to add some window toppers to the bamboo blinds. But, overall….I’m thrilled. Good job, Lori, in using what you have!!! Wonderful!! Maybe the bigger rug can be made from smaller ones hooked together. I have read that can be less expensive sometimes. Blessings! OH wow….great idea! I’ll have to look that up on someone else’s blog! HA! By the way your blog is really coming along! I hope you will write a series on experiences from your childhood and people that you knew and remember. This is an inspiring blog, Lori. I may copy your ideas! Lori I feel so the same way you do about your office! This reached me on so many levels I too am inspired and plan to do an office makeover this summer! Please feel free to share your thoughts and ideas with me! I love your office and the room it is housed in. Where I am it is so dark in the middle of my family room but I love being in the center too! Thanks so much for this post and also thanks for linking up to “The Ole’ Saturday Homesteading Trading Post blog hop” this week! 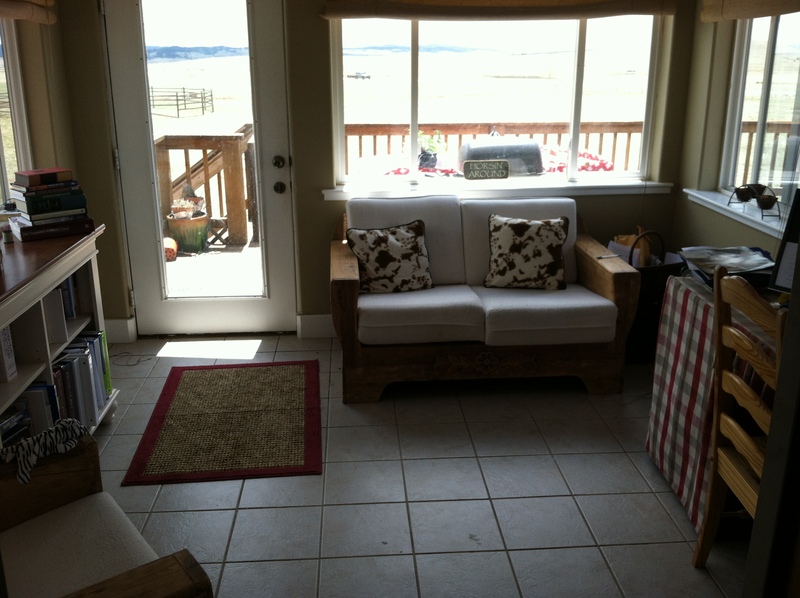 Our sunroom is right off the kitchen and breakfast area….so it seems to be in the middle of things…which is a good thing and can also be a bad thing. Right now, with some major projects due, it’s been a little frustrating. BUT, then I think of having to go off and work away from my family and well, ….let’s just say, I’m happy right where I am!